Yarn. I used Worsted Weight 4 in Cotton. 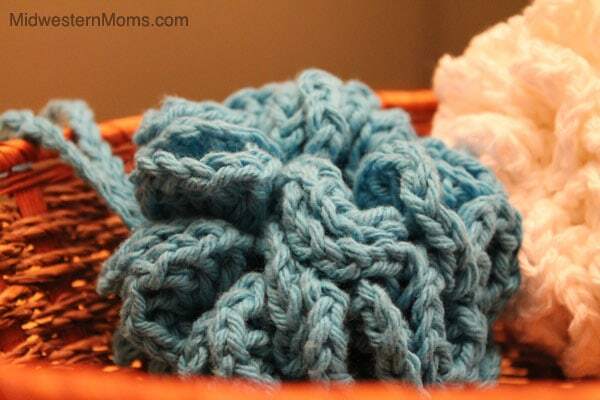 You can also use a cotton, nylon blend to ensure that the puff dries father. Chain 10, sl st to create a circle. Round 1: Single crochet (ch 5, sc in circle) Repeat () 40 times. At the end of the row, chain 30 to create the handle and sc back on the circle. Round 2: In each ch 5 loop, (sl st, 8 dc, sl st). Knot and tie off after the end stitch. Weave in ends. This makes a great bath puff and the size turns out to be perfect. I also like that I can either hang this up by the string, or put it over the faucet. Please have a look at Amber from Thrifty Ninja’s craft today! She made a t-shirt scarf that would make a great gift for any woman you need to buy for on your list.